Orbital ATK successfully launched its Cygnus spacecraft aboard a United Launch Alliance (ULA) Atlas V launch vehicle with approximately 7,900 pounds (3,600 kilograms) of cargo and small satellites that will be deployed directly from the spacecraft. The launch marks the beginning of the company’s fifth operational cargo resupply mission (OA-6) for NASA, and the first Cygnus to conduct scientific experiments onboard the spacecraft. Cygnus will deliver vital equipment, supplies and experiments to astronauts aboard the International Space Station (ISS) as part of its Commercial Resupply Services-1 (CRS-1) contract with NASA. 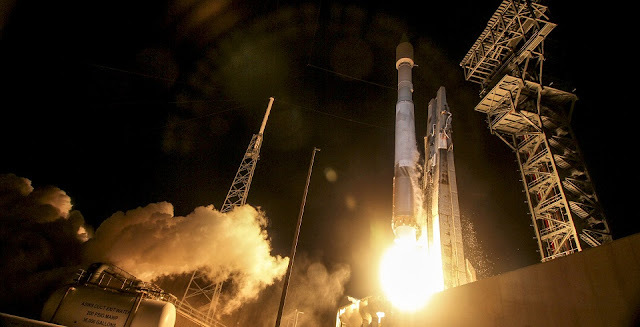 Lift-off of the Atlas V rocket took place at 11:05 p.m. (EDT) on March 22 from Cape Canaveral Air Force Station, Florida. Following a 21-minute ascent, the S.S. Rick Husband Cygnus spacecraft was successfully deployed into its intended orbit approximately 144 miles above the Earth, inclined at 51.6 degrees to the equator. Orbital ATK’s engineering team confirmed that reliable communications have been established and that the vehicle’s solar arrays are fully deployed, providing the necessary electrical power to operate the spacecraft. Cygnus will be grappled at approximately 6:00 a.m. (EDT) on Saturday, March 26. The spacecraft will remain attached to the ISS for approximately two months before departing with roughly 4,400 pounds (2,000 kilograms) of disposable cargo for a safe, destructive reentry into Earth’s atmosphere over the Pacific Ocean. Cygnus’ large-volume and pressurized disposal cargo capability, a critical service to NASA, is unique among America’s commercial cargo providers. The OA-6 mission allows Cygnus to demonstrate its unique flexibility as a spacecraft with capability to launch atop multiple launch vehicles and serve as a platform for science experiments. Once it departs the ISS, Cygnus will enter a specific orbit to deploy five CubeSats, utilizing a NanoRacks CubeSat deployer. Taking place onboard Cygnus, the Spacecraft Fire Experiment-I (Saffire-I) will study the behavior of a large fire in microgravity. The final experiment to take place aboard the S.S. Rick Husband will be the Reentry Breakup Recorder (REBR). The REBR will measure and record Cygnus’ breakup as it reenters Earth’s atmosphere. "I am proud of the integrated team who worked together flawlessly to make our third launch of the year a success," said Col. Thomas Falzarano, 45th Operations Group commander, who served as the Launch Decision Authority. "This mission once again clearly demonstrates the successful collaboration we have with our mission partners at NASA and ULA as we continue to shape the future of America's space operations, and serve as the 'World's Premier Gateway to Space.'" The Cygnus system, which consists of a common service module and a pressurized cargo module (PCM), achieves high reliability by incorporating numerous elements from flight-proven spacecraft technologies. The service module is built and tested at Orbital ATK’s Dulles, Virginia manufacturing facility. It uses avionics systems from Orbital ATK’s LEOStar™ and GEOStar™ satellite product lines, plus propulsion and power systems from the company’s GEOStar communications satellites. The recently extended PCM, which is based on the Multi-Purpose Logistics Module developed by Thales Alenia Space for NASA, enables Cygnus to carry over 50 percent more cargo than the previous version. The enhanced Cygnus also uses Orbital ATK’s UltraFlexTM solar arrays, which are the latest in lightweight, space-qualified, electrical power technology. The arrays were manufactured at Orbital ATK’s Goleta, California facility. Orbital ATK’s composite structures and retro motors also supported the launch of the ULA Atlas V rocket. The company manufactured a 10-foot diameter composite heat shield for the launch vehicle, using advanced fiber placement manufacturing techniques at its Iuka, Mississippi facility. The Elkton, Maryland facility contributed eight Orbital ATK retro motors, providing thrust for separation of the spent first stage. Orbital ATK has two additional CRS missions scheduled in 2016 to support NASA’s ISS cargo and payload mission needs. The company’s upgraded Antares launch vehicle remains on schedule for a full-power hot-fire test in late spring. Flight operations for Cygnus and Antares will resume mid-year from NASA’s Wallops Flight Facility in eastern Virginia. Beginning in 2019, Orbital ATK will continue its support of the ISS and its crew by carrying out a minimum of six initial cargo missions under the recently awarded CRS-2 contract.